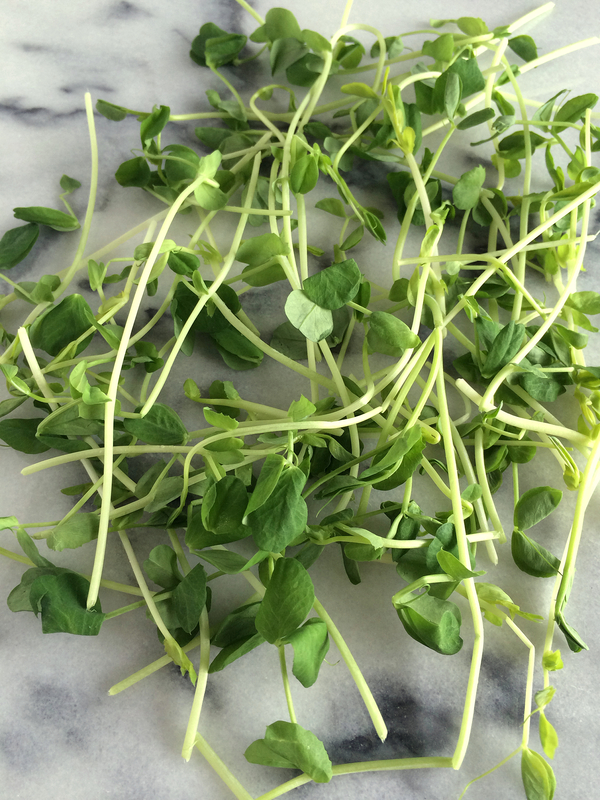 Pea shoots, pea tendrils, pea sprouts…what’s the difference? Pea sprouts are the first thin stems that sprout after planting, are light green, and may or may not have leaves. Pea tendrils are the delicate, curly vines at the top of the stem. Pea shoots are the more mature stems with leaves and tendrils attached. Pea shoots are sometimes called pea tendrils, pea greens or pea tips. If you’ve never had them, they taste just like…peas! 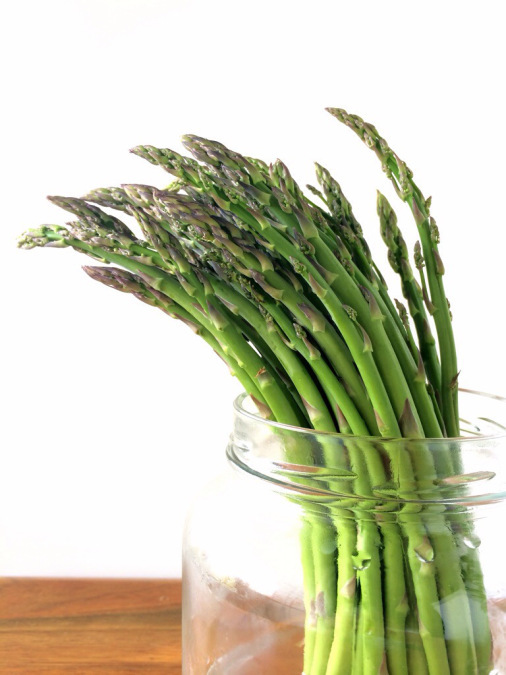 Their delicate sweetness and grassy crunch make them perfect for a springtime salad. Plus they’re packed with nutrients — high in vitamin C, A, and protein. Store them like you would your other salad greens (in the crisper drawer) and use within a couple or few days of purchase. You can often find them at farmers markets, in CSA boxes, and they’re even popping up in some grocery stores. Or, if you have a green thumb (unlike me), grow your own. Here’s a nice How To link with video…I bet even I could do it! 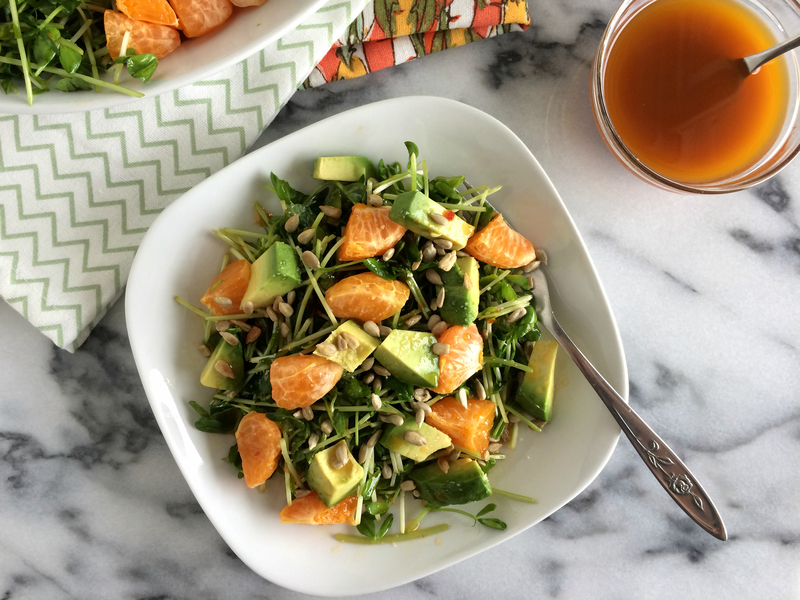 Since citrus is still in season – I’ve been seeing a lot of mandarin oranges lately in my grocery store – I decided to pair the pea shoots with orange and added avocado for a creamy contrast of texture. 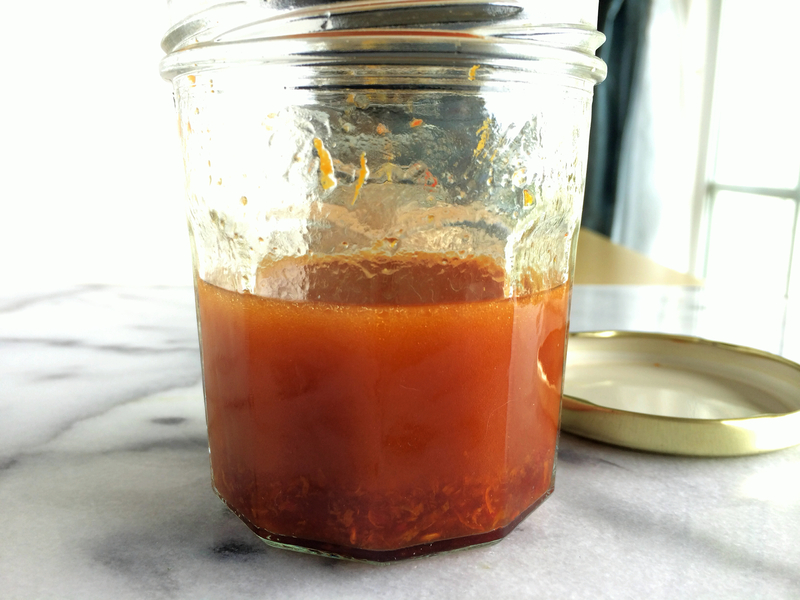 For the vinaigrette, I wanted some spiciness to balance the sweetness of the pea shoots and oranges so I added Thai garlic chili paste. If you don’t have any, no worries, you can use sriracha plus a very small clove of minced garlic. The dressing will taste fairly acidic, but after adding it to the salad ingredients – especially with the buttery avocado – it balances out nicely. The pea shoots were roughly 6 – 8 inches long, so I piled them up and cut them into thirds to make them bite size. I put them in a bowl and poured about a third of the dressing over top. I gently tossed them in the dressing to coat them evenly, then placed the salad ingredients separately on a serving dish. Pre-dressing the shoots allows the flavors to absorb. I didn’t want to combine everything together in one bowl with the dressing because the avocado could get mushy and the pea shoots are fairly delicate. This also allows the individual flavor of each ingredient to stand out rather than everything being over-mixed and the flavor too homogenous. 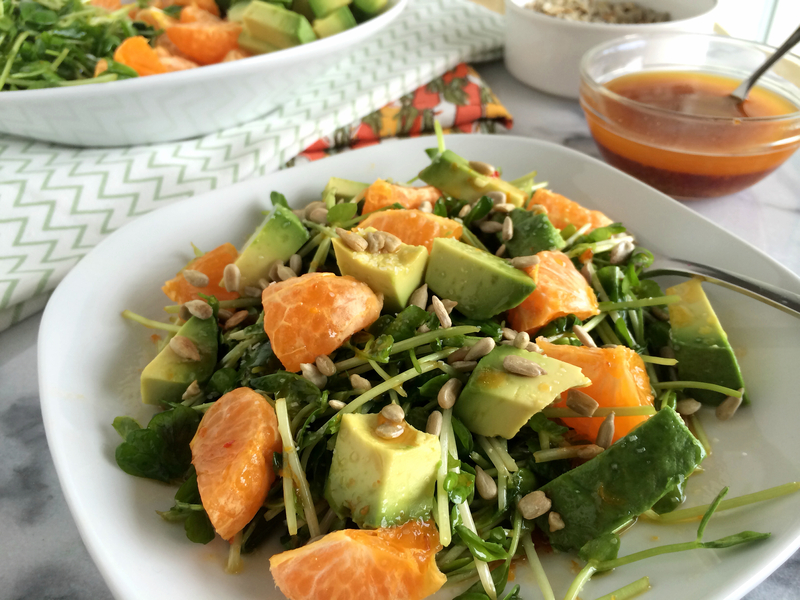 I dish up the salad onto plates starting with a nice pile of dressed pea shoots, then a scattering of mandarin oranges and avocado, sprinkle with a pinch of salt, drizzle on a couple spoonfuls of the orange-chili vinaigrette, and finish with toasted sunflower seeds for a nutty crunch. This is one flavorful plate of healthy springtime goodness! Add all vinaigrette ingredients to a bowl or jar and whisk or shake (with the lid on tightly) until well combined. 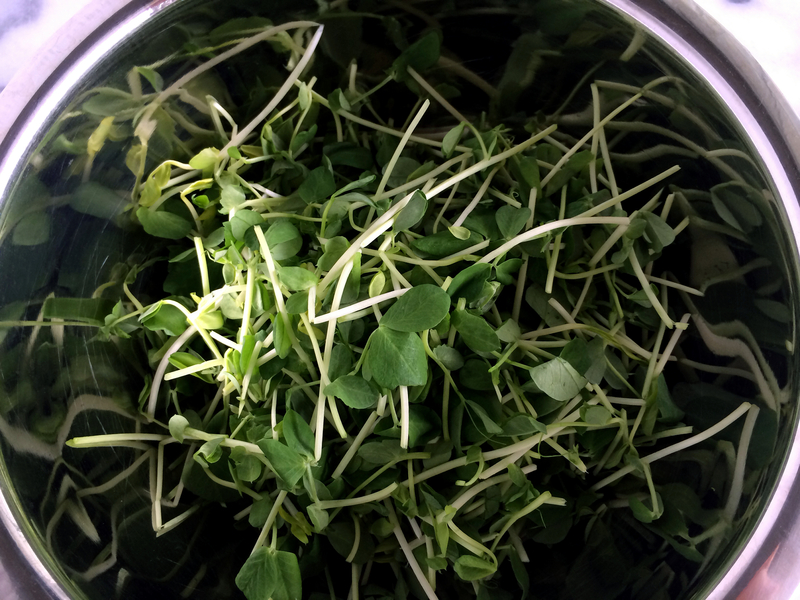 Place pea shoots in a large bowl and gently toss with 1/3 of dressing to evenly coat shoots. 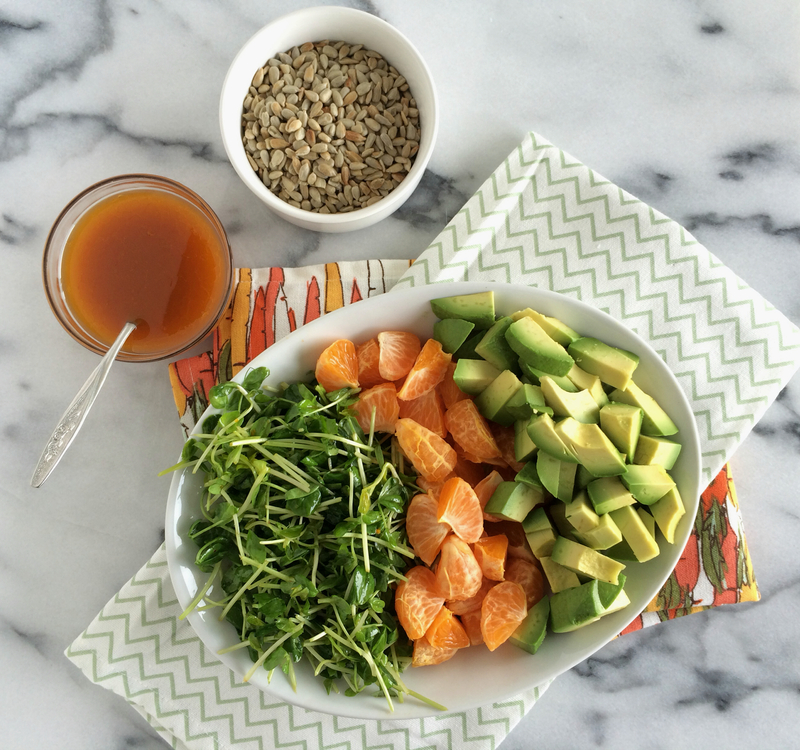 Arrange pea shoots, oranges, and avocados separately on a serving plate. 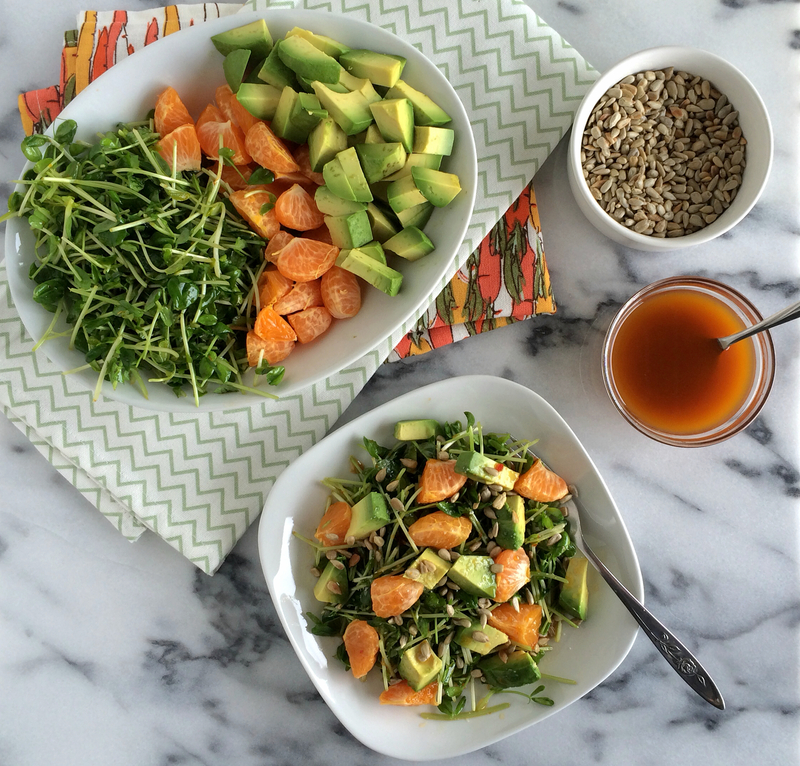 Assemble salads individually–add a pile of pea shoots to the plate, then oranges, then avocados. (Or gently combine all ingredients in bowl or on a serving plate). Drizzle with additional dressing, season with a pinch of course salt and sprinkle with toasted sunflower seeds. Enjoy! I love all of these ingredients together! Perfect for the warmer weather. The dressing looks particularly amazing! Yum!